T-shirt to benefit Camp Fire community, AKA "Pleasure"
Fresh Fruit Zip Bag, Eat the Rainbow! Announcement Here you will find bags sewn with joy, along with a few vintage items and supplies I have decided to release out of my craft room! Here you will find bags sewn with joy, along with a few vintage items and supplies I have decided to release out of my craft room! 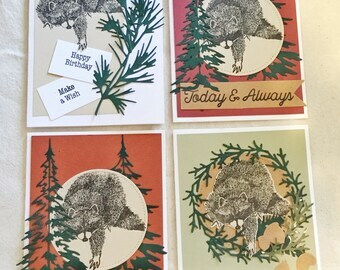 Very cute and love buying handmade cards...absolutely above a store bought card! Get Well Card, Stay Cozy! It arrived quickly, and it's perfect for a gift card for a book lover. Should never there were 2. This is the absolute perfect accessory for my Halloween costume this year. I was thrilled to discover this shop. Beautifully handcrafted items, excellent customer service, and lightning fast shipping rate this seller 5 stars! I sew at a little maple desk with all of my tools within close reach. I know it looks busy, but I find the colors and craft supplies enlivening. The cutting table, where I seem to spend most of my time when working on a project. I love to have a cup of coffee or tea staying warm while I go about creating. As a child I was amazed by what people could create with fabric! I was thrilled just to wander in a fabric store, but didn't feel I belonged there as I didn't really know how to sew. Over many years, and many ripped-out stitches (As you sew so shall you rip, I say) I have learned to sew. I still find it to be a challenge and a delight! I have enjoyed making costumes for my own children and others. I occasionally make a quilt. I most enjoy making bags..they are fun and functional. The playroom is now my studio. It gets cleaned and it gets cluttered..a stop/start motion film of my craft room would look like a tide of cleaning, messing, cleaning, cluttering! I love being able to create for my little shop. It is a thrill each time I package up a carefully stitched bag and send it out to it's new owner! I am a stay-at-home mom, formerly a kindergarten teacher. I am easily delighted (child-like, some would say? ), enjoy eating, swimming, dog-walking, being with family, reading, and have a too-vast collection of craft books. My husband, engineer helping to clean the environment by day, clever T shirt designer by night!